Surgical art illustrating robotic prostate cancer surgery using the da Vinci® robotic system. Prospective patients are all confused with what is written in the media about robotic surgery, this illustration depicts the selective nerve-sparing technique that helps to preserve erectile function – one of the major advantages of this operation. SKU: URO01. Category: Urology (URO). 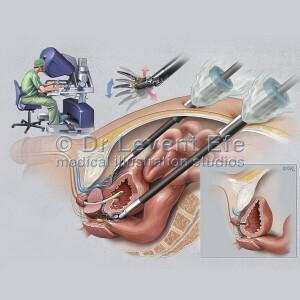 Tags: bladder, daVinci_Prostatectomy, incontinence, nerve_sparing, prostate, prostate_removal, prostatectomy, robotic_surgery. Surgical art illustrating robotic prostate cancer surgery with the da Vinci® robotic device – a surgical tool that facilitates complex laparoscopic surgical procedures. This remote controlled surgical device allows a specially trained surgeon to operate the “robot” from an ergonomically designed console. 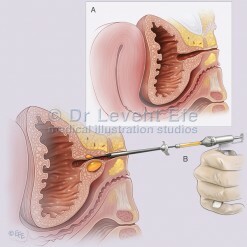 The main illustration depicts selective nerve-sparing technique to preserve erectile function, and the right inset showing the bladder-urethra anastomosis. 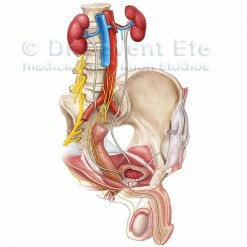 Protection of erectile function and urinary continence are the major advantages of this procedure (over laparoscopic and open techniques), with the major benefit for the patient being a shorter hospital stay. Although the use of the da Vinci® robotic device is more expensive, an increasing number of urologists and clinics are undertaking the procedure.